The Warrnambool Standard - Over 100 Warrnambool community members and students attended the first day of the roadshow at Emmanuel College. Local Stuart Bethune gets a lesson on how to clean and care for his grandfather's WW1 bravery medal. The News - Bayside - Handley Scoble enlisted for World War I at the Frankston Mechanics’ Institute in early 1917 and then joined the other troops for a rousing send-off from the hall steps. 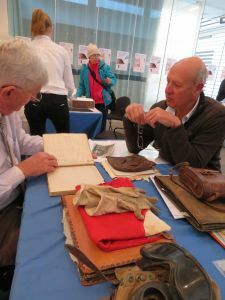 One hundred years later, his grandson Alan Scoble attended the Frankston War Heritage Roadshow at that very same venue. 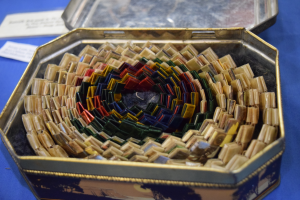 WIN News - Shepparton - Interesting wartime memorabilia items uncovered at the War Heritage Roadshow events in Shepparton and Wodonga in May including a Second World War belt made from butterfly wings and cellophane cigarette papers (pictured below), and puppets made by interns at the Tatura Camp. 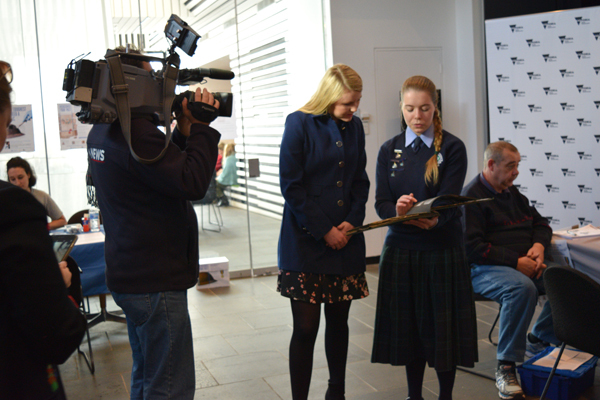 Sophie Lewincamp, conservator and event coordinator speaks with WIN News about importance of wartime heritage and their stories. More stories from Shepparton also in the Shepparton News. Bendigo Advertiser - Bailey Edwards (below) brought his great-grandfather, gunner Mervin Herbert Webb's diaries and letters to the Bendigo War heritage Roadshow. WIN News - Ballarat - Visitors to the War Heritage Roadshow Ballarat Laura and Marcus chat with WIN News about their wartime memorabilia and the importance of its preservation, as well as David Gardner, Director of the RAAF Museum - our war heritage expert (pictured below). 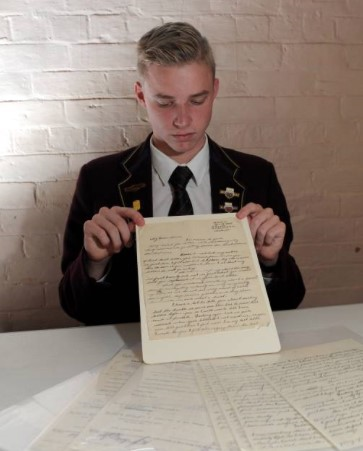 The Courier - Ballarat High School student Laura Benney attended the Ballarat War Heritage Roadshow with her family’s war memorabilia including letters, medals and photos (pictured below). "We have a letter from my great-great grandfather and it was the last letter he wrote when he was in the trenches on the Western Front," Laura said. "He was worried his family had forgotten him because he hadn’t received anything from them recently. They had sent letters but they hadn't arrived and he died about a month after he wrote that letter. It's heartbreaking."